1. Pick up a six-pack of Stewarts Lemon/Lime Soda; then, peel off the labels for a cleaner look. Let your child decorate a tag and slip it around the neck of the soda bottle. Deliver to friends/neighbors or use as a host gift for a St. Patty's Day get together. 2. 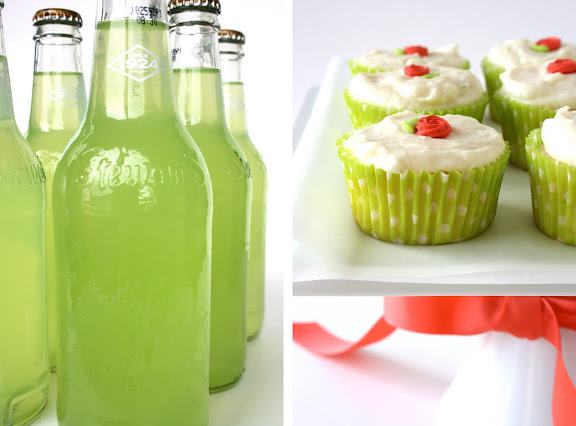 Make a batch of lemon/lime cupcakes using green liners. If you don't have access to fun liners, opt for white instead and add green sprinkles. I used this recipe, but this one looks awfully good too. p.s. we had our own impromptu morning...turns out I tossed the food coloring before moving here, but I did have some green sprinkles. So my kids ate scrambled eggs with green sprinkles this morning...random, but they loved it! For every St. Patty's Day of my entire life we've had Lucky Charms for breakfast. Now my kids do too. They only get them once a year, so it makes for a cheap, easy, very exciting tradition! Next year top oatmeal (steel cut now that you've converted ;-)) with green sprinkles, it's just sugar after all. Thanks for the easy and fun ideas! I'm planning on baking some mint brownies later today. Any excuse for brownies is a good one. As an Irish kid with a mom whose birthday is on St. Patrick's Day you can bet I have had a huge assortment of green cakes, cupcakes, pies, cookies, and of course the notorious green milkshake from McDonalds. I love this holiday. Hmmmm those cupcakes look to die for. The green bottles of lemon/lime soda are so pretty in your photo. I love reading your blog! Get so much good ideas and inspiration from you! Next year I'm definitely doing the Stewart's soda. It's perfect because my last name is Stewart. Why didn't I think of that? !